With your just-completed tax filing, you may not want to think about taxes and your finances. However, now can be a great time to review your tax planning and recordkeeping process and to take stock of your personal finances. How smooth was your tax preparation this year? If you struggled to find all the tax-related documents, think about establishing a better recordkeeping system. 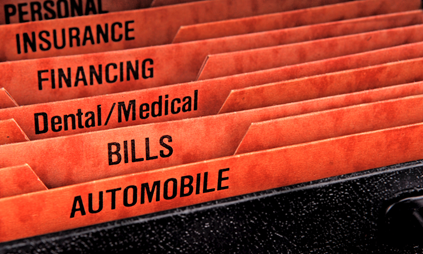 You can go the traditional route with a paper filing system. Use a file box (or accordion-style file) and label the files or sections with tax related topics (charity donations, medical expenses, business-related expenses, etc.) Make sure you keep up with the records throughout the year and your tax filing can go easier next year. If you want to be kind to the environment and make your filing trouble-free, consider going paperless. Most banks and credit unions enable customers to download statements. You can also use a scanner to scan any tax-related receipts and save them as a PDF. Make sure you label the files on your computer and consider storing a backup copy on a thumb drive or use a cloud service such as DropBox. Just be careful about placing any sensitive information in an unsecured cloud service. If you use Quicken for your home bills, you can flag payments you make by check or credit card as tax deductible throughout the year. At tax time next year, you can import those records into TurboTax. You can even use an app on your smartphone to make tax recordkeeping easier. Expensify and Shoeboxed are two apps that help with receipt record keeping. Most apps in this category do charge a fee; so, search online for the reviews and specs to see which one is the best fit for you. If you think you paid too much in taxes, now is a great time to look for ways to reduce the amount of taxes you will owe next April. Here are a few strategies, which can help you lower your tax bill next year. Invest fully in your 401(k) or IRA. Don’t wait until December to find the cash. Contribute each month to your retirement accounts and reach full investment by December. Visit this link for our post on retirement accounts. Invest in Your Education. Do you need to take classes to improve skills in your profession or to advance at work? If your employer (or the law) requires you to take work-related courses (such as continuing education credits), you can deduct the cost of those courses. Search for a New Job. If you are not happy with your job, now could be a great time to search for a new one. Expenses related to a job search (travel, placement fees, etc.) are tax deductible. To qualify for a deduction, you must incur these expenses on a job search in your current occupation. Visit this link, for a full listing of tax-deductible job hunting expenses. Buy a house or a vacation place. Are you a renter? Have you been eyeing a vacation property at the shore? You can deduct mortgage interest and property taxes for your primary home. You can also deduct these expenses for a second home. The IRS will consider the second property a personal residence if you do not rent the home out for more than 14 days in a year. Filing taxes is all about reviewing records for the past year. With a financial plan, you look forward to establish goals and make a plan to reach the goals. Since you had to gather many financial records for filing taxes, this can be a great time to review your financial plan. In the end, the best way to minimize taxes is to establish a solid financial and estate plan. You can take your completed taxes to a financial planner for a consultation. A good financial planner can review your taxes and help you improve your management of your financial assets overall financial planning.